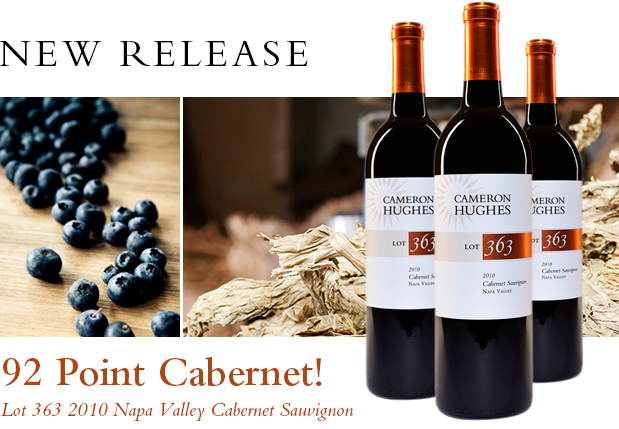 Just Released - 92pt Napa Valley Cabernet from Atlas Peak! If Napa’s mountain-grown Cabernets are your thing, I have the perfect wine for you: Lot 363 2010 Napa Valley Cabernet Sauvignon. It’s actually Cabernet from the Atlas Peak appellation, but the producer didn’t want us to put that on the label since we are selling this for less than half their price. Fine…we’re flexible. Grown in hillside vineyards at 1,800 foot elevation, the wine is aged in 55-60% new French oak for 22 months before bottling. 92% Cabernet with the balance Petit Verdot, Malbec and Merlot, it is dark, dark, dark and punches out of the glass with gobs of tasty oak, sweet florals, rich plum and blueberry with plenty of mocha on a big, powerful frame. Rich, pure and structured - there is nothing subtle about this intense Cabernet as it lays out on your palate in waves of dark fruit, blueberry and red licorice. It finishes huge and juicy with silky, fine-grained tannins and persistent dark fruit. Fantastic. There are only 700 cases of this incredibly classy and pure expression of hillside fruit, so do not wait until the review hits in October…it’ll be gone. Grab this by the case and drink now and over the next 12-15 years. As a New Release special offer, if you buy before midnight on Saturday night, I'm taking 10% off a case and 15% off two cases (which also includes free shipping). As always, if you have any questions or need assistance with your order, please don't hesitate to email us or call 800-805-1971. Copyright © 2013 Cameron Hughes Wine All rights reserved.